The pages of my notebook stick together from the copious honey that oozed through a special dinner recently offered at Full of Life Flatbread in Los Alamos in honor of bees. Today, bee colonies across the US are facing a mysterious demise: colony collapse disorder (CCD). 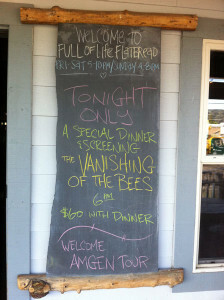 To help raise awareness of their plight through flavor and film, Chef Clark Staub produced a delicious bee-dependent meal that the Full of Life team served during a screening of the documentary Vanishing of the Bees. Like Pinot Noir producers who source fruit from today’s sweet spot vineyards expressing deep concerns about a climate change effect on their future vintages, chefs fear the loss of America’s bees because they realize the impact such a disappearance would herald in limiting their culinary tools and options. Bees pollinate one third of US crops and, without these pollinators, US agricultural products from almonds to blueberries to strawberries would cease to be economically viable to produce. From the starter of warm almond soup with stinging nettle pesto and buckwheat honey snazzed with a burst of garlic to dessert featuring orange blossom honey and lemon verbena ice cream with roasted Blenheim apricots, the evening’s menu reminded our palates how the patient and steady work of bees brings a wide variety of flavor to our tables. Foodies would mourn the loss of flavors and aromas but the whole country would struggle with the loss of these willing pollinators who help produce 1 out of every 3 bites we eat. Across human history—from the ancient Egyptians who floated hives along the Nile River as they followed the bloom to the 21st-century Floridians who truck their bees to California, New England, and around the country to help pollinate important crops—humans have benefitted from working with bees. However, this beneficial relationship will soon end unless quick action is taken to isolate and address the root cause of CCD. The film took care to retain some sense of the unknown with regard to the likely culprits for CCD. However, the meeting of American bee keepers David Hackenberg and Dave Mendez with French beekeepers helps make quite plain that the experience of American colony collapses resemble very much the French colony collapses from 10 years ago before the banning of a particular systemic neonicotinoid pesticide produced by Bayer. Without even speaking the same language, these transatlantic beekeepers fully recognized they shared the same devastating experience with their hives, in France with the neonicotinoid imidacloprid and in the US with the neonicotinoid clothianidin. The good news: after sustained protests by French bee keepers against Bayer, imidacloprid was removed from the market and bee populations recovered. After the film, one beekeeper asked himself, “Why don’t I drive my tractor downtown to make a statement about bees?” Perhaps several tractor owners can channel a little French action to make a local and loud statement about banning clothianidin in the Central Coast and across the country. As a frequent viewer of ag documentaries from King Corn to Food Inc., I foundVanishing of the Bees especially disturbing. While my palate discovered the breadth of bee influence on our diets throughout the delicious salad of charred Yes Yes Nursery romaine , spring onion, and carrot with San Marcos honeycomb and a dinner of Pinot Noir-smoked wild salmon flatbread with wild fennel and bee pollen, my brain grew increasingly frustrated. What a terrible tradeoff: in order to achieve today’s excessive over-production of corn in the US, the 2003 EPA approved this toxic pesticidal treatment for corn, canola, soy, sugar beets, sunflowers, and wheat that had already demonstrated in Europe its power to kill whole colonies of bees. The neurotoxin applied to sunflower and corn seeds before planting results in low level sublethal effects over time; the neurotoxin confuses and sickens the bees leading them to abandon hives with dying baby bees and their queen. Because the industrial food complex demands ever more cheap, tasteless corn, the 2003 EPA approved this systemic pesticide, which is sprayed on seeds in the factory and able to kill insects, including bees, throughout the plant’s lifetime. 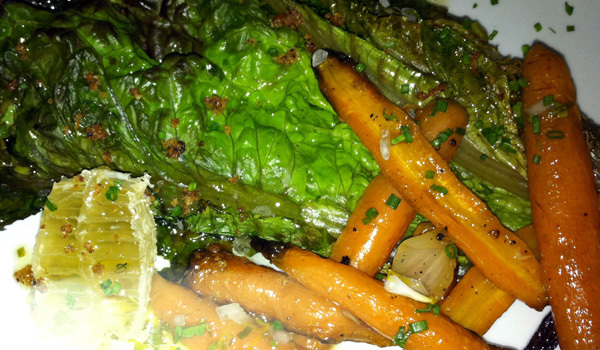 For the benefit of a diverse food system, this pesticide must be banned. 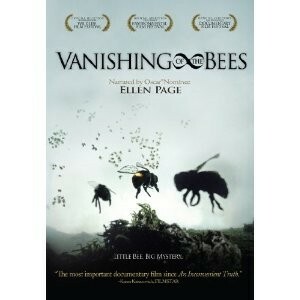 One scene in particular in Vanishing of the Bees felt like witnessing a war zone: 40,000 hives had within weeks been abandoned by workers and drones who left behind a few lingering, dying bees including babies and the queen. In corn country, it hurts to lose the family farm to agribusiness-inspired debt, but for these beekeepers, it was as if thousands of their friends had died on the same day. Because military-grade chemicals used for munitions were steadily adopted for agricultural use after World War II, these peaceful beekeepers surveyed the “collateral damage” on these innocent insects from a repurposed chemical initially designed to kill people. Military-grade lethal chemicals have no place in our agricultural system which, with wind and flying insects, cannot be effectively contained on a particular plot of land. Amidst all this discussion of pesticides and colony collapse in the film, the attendees at this dinner and serious movie enjoyed the Full of Life meal and Jorian Hill wines or Firestone beer. 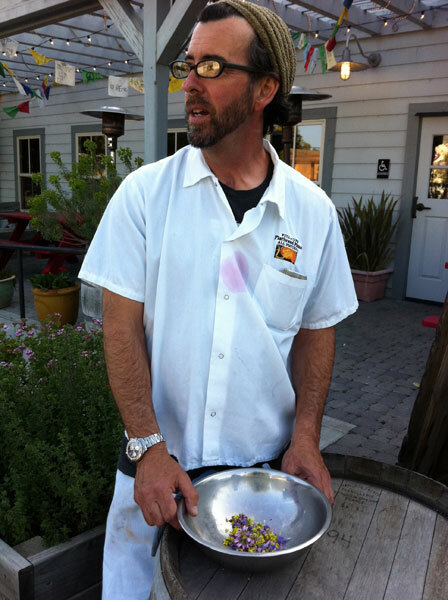 And yet, underneath all the friendly talk between Santa Ynez locals and visitors during this evening of dinner and fun fellowship, one could feel the seriousness in the room especially from Chef Clark and the beekeepers in attendance. 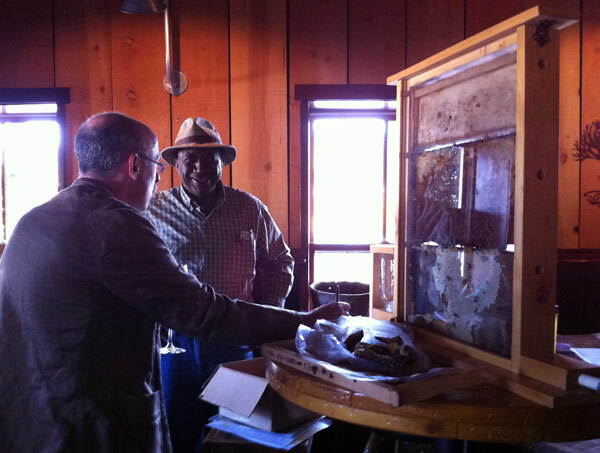 Before dinner, Lompoq beekeeper Archie Mitchell was enthusiastically advocating for keeping bees. “We need more beekeepers” he declared while doing his best to entice new beekeepers to the cause, including displaying a closed glass case with healthy bees working away at their instinctive tasks, a small slice of hope. Ron Gromak, a Santa Maria bee keeper, identified a further threat to bee health not mentioned in the film: innocuous-sounding “rose food” that anyone can buy at the local or big box hardware stores. Fertilizers for the home garden can actually use a more potent formula than for commercial growers because, the thinking goes, it will be applied in smaller quantities than on a larger farming operation. Yet, that highly toxic fertilizer that your relatives and neighbors apply to their rose bushes: it kills bees. Surely most rose enthusiasts would be aghast to learn that by beautifying their plants they were helping to kill bees. Spread the word about the dangers of rose food on bees among the rose enthusiasts you know. The bee keepers, horticulturalists, farmers, and chefs who collaborated to produce this dinner and encourage discussion and action on a host of threats recognize that this is our DDT moment. Before DDT was banned in 1971, the US was in danger of passively exterminating our own national mascot, the Bald Eagle. The chemical companies fought for three more years to continue to market DDT before the last legal challenge was rebuffed. Today, we’re in danger of complicating our national survival by passively exterminating colonies of bees. Taking action soon to make your voice heard on the issue of toxic chemicals in plant materials and fertilizers will help government officials make the right choice quickly to remove these products from the US marketplace. 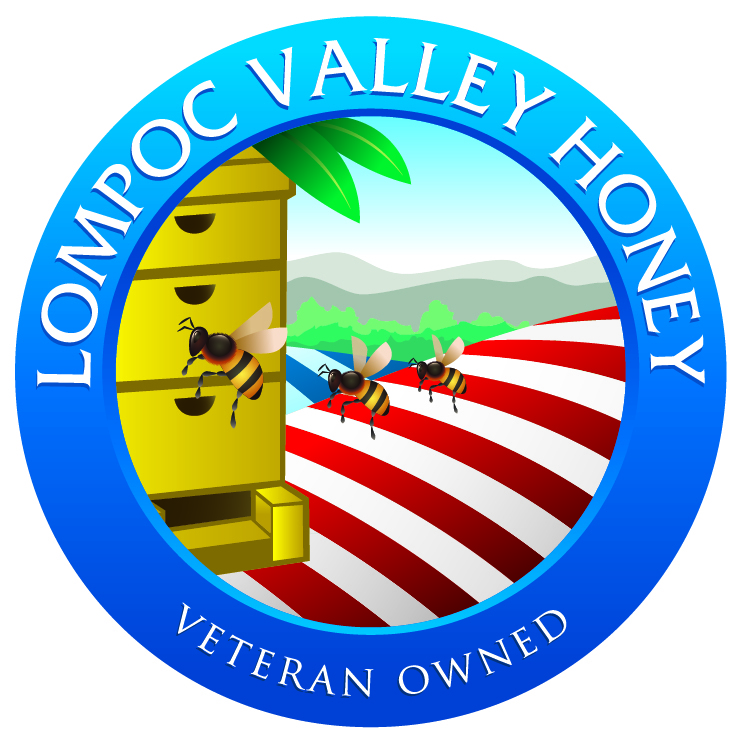 As powerful as the agribusiness and chemical lobbies might be against individual beekeepers, when every stakeholder in the health of the US bee population comes together including chefs, foodies, almond growers, ice cream store owners and employees, beekeepers, and anyone who appreciates the foods bees make possible, we will most certainly have far greater numbers on our side, like a swarm of healthy bees. But first, we have to swarm. Thanks to Clark Straub and the Full of Life team for producing such a thoughtful evening that satisfied on many levels. The wild salmon flatbread with wild fennel and bee pollen was so good and beautiful, with festive fennel and splashes of salmon—I ate it all before thinking to take a picture. ! Call or write your Congressional representatives and make your voice heard. Find your House Representative here.